In accordance with the Federal Aviation Administration (FAA), GGB EP™63 self-lubricating engineered plastic bearings recently passed a variety of flammability and toxicity tests for interior aircraft certification. The tests demonstrated that the EP®63 engineered plastic material is in compliance with Federal Aviation Regulations (FAR) 25.853 and 25.855, making it suitable for interior aircraft applications such as seats, hinges, latches and passenger bins. To achieve the necessary compliance assessment, testing was administered and certified by three industry independent organizations: CREPIM, Cofrac and Nadcap (the National Aerospace and Defense Contractors Accreditation Program). Technical experts from each organization performed conformity assessments designed by the FAA for cabin and cargo compartment materials, including resistance to flame when tested to a 60- and 12-second vertical Bunson burner test. GGB’s EP™ polymer bearings provide excellent wear resistance and low friction in both dry and lubricated operating conditions over a wide range of applications. Consisting of nine different materials, the EP® series of engineered plastic materials is made of a variety of resins compounded with reinforcing fibers and solid lubricant. They exhibit excellent dimensional stability, low coefficients of friction, high compressive strength and creep resistance, low thermal expansion and good thermal conductivity. 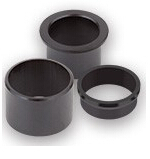 For more information, visit https://www.ggbearings.com/en/products/solid-polymer/ep63 or contact marketing@ggbbearings.com. GGB is the world’s leading manufacturer of high performance, self-lubricating and prelubricated bearings with production facilities in the U.S., Germany, France, Brazil, Slovakia and China. The company serves more than 30,000 customers worldwide in a broad spectrum of applications and industries including automotive, fluid power, agricultural and construction equipment, sports and recreation equipment, renewable energy, primary metals and general industrial. Its product offerings include metal-polymer, engineered plastics, fiber reinforced composite, metal bearings and bushing blocks. Also provided are industry-leading R&D and testing capabilities, flexible manufacturing, technical support and a global network of istributors. www.ggbearings.com. The Board of Directors of ABC Bearings Limited at its meeting held on 16 March 2017 has granted its approval for the sale of its entire 2.5% equity stake in NSK-ABC Bearings Pvt. Ltd.a company registered under the Companies Act, 1956 having its registered office at Plot No. A2, SIPCOT Growth Centre, Oragadam, Mathur Village, Sriperumbudur Taluk, Kancheepuram District, Tamil Nadu 602105, India to NSK India Sales Company Pvt. Ltd., a company registered under the Companies Act, 1956 having its registered office at 2nd Floor, Block I, TVH Beliciaa Tower, No. 7111, MRC Nagar Main Road, MRC Nagar, Chennai, Tamil Nadu 600028, India. Shares of ABC BEARINGS LTD.-$ was last trading in BSE at Rs.169 as compared to the previous close of Rs. 166.6. The total number of shares traded during the day was 2102 in over 52 trades. The stock hit an intraday high of Rs. 169.95 and intraday low of 165.65. The net turnover during the day was Rs. 354676.